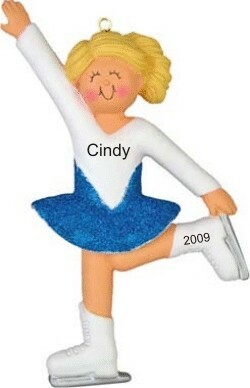 There's something genetically programmed in each of us when we see someone skate across the ice. We all want to fly, and flying across the ice seemingly effortlessly appears to be part of that urge. 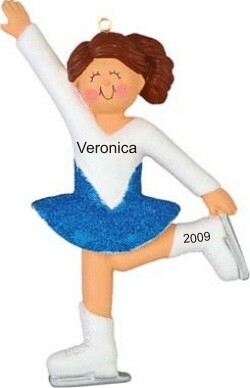 Ice skating has been verified to be a common practice as long as 5000 years ago. Amazingly, ice skates made of animal bone with straps to fix them on the feet have been found in Switzerland dating to just over 3000 B.C. Ice skating is mentioned in written works from the 1100s AD, and appears in paintings dated in the 1400s. 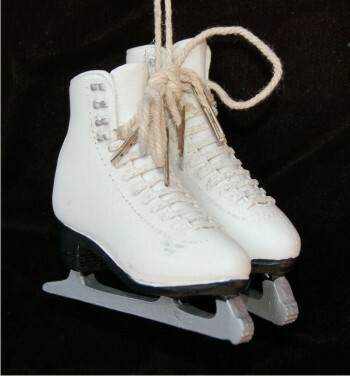 It was the Dutch who added sharp edges to skates, making it possible to glide quickly and smoothly over the ice without the need of a pushing stick. Today's skating includes figure skating, skating for ice hockey play, and ice skating for pleasure and social reasons. 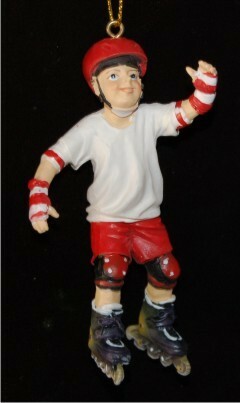 For all skating enthusiasts we offer our Skating ornaments. 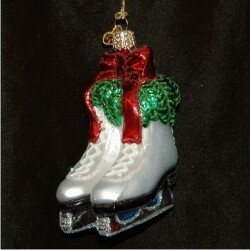 We offer designs for figure skater ornaments, ice skater ornaments, hockey skater ornaments and others. Choose the design that best reflects your passion. 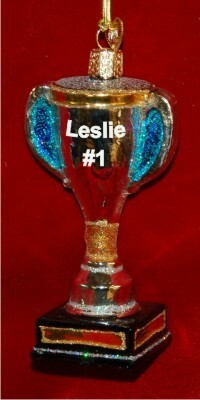 Each can be personalized with the recipient's name and the year. 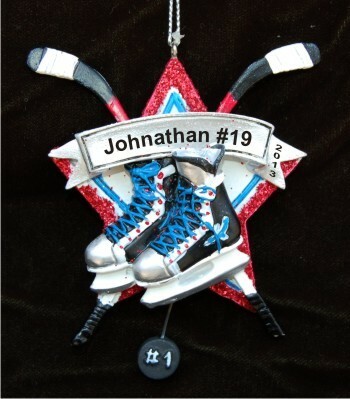 The skate ornaments are created in polymer clay, resin and blown glass; each arrives in our classic black velvet pouch, ready to make a great personalized Christmas ornament gift. 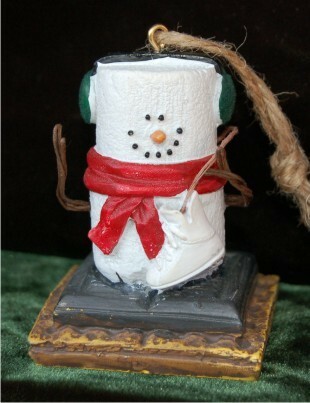 Wholesale and bulk pricing begins at 12 ornaments. 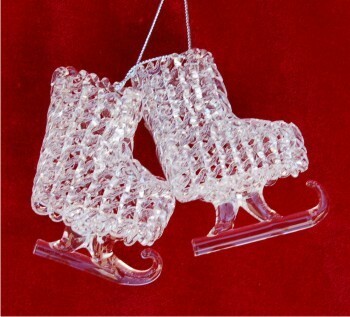 Skating ornaments in bulk are particularly popular as party favors if you're holding an ice skating birthday party. Whatever your needs, click on the Contact Us link at the bottom of the page in the blue banner and tell us. 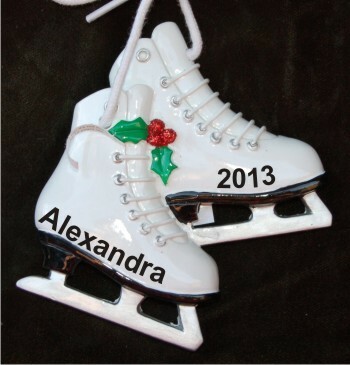 We're happy to get creative with you and develop a custom skating ornament package that's perfect for you.